Vegetables. I know it’s not often to get excited about them, although, you might be one of the odd ones (like me) that truly enjoys eating their veggies. When I was younger I definitely didn’t eat as much veggies as I eat today, but that’s probably due to the way I look at food now. Knowing the different vitamins, phytonutrients, minerals and antioxidants that are needed to build my body, support my skin, balance my hormones and provide me with energy, I look at food as nourishment, not just to fill me. I highly suggest you start adopting this way of looking at food too! Trust me, you’ll start to appreciate it a lot more! 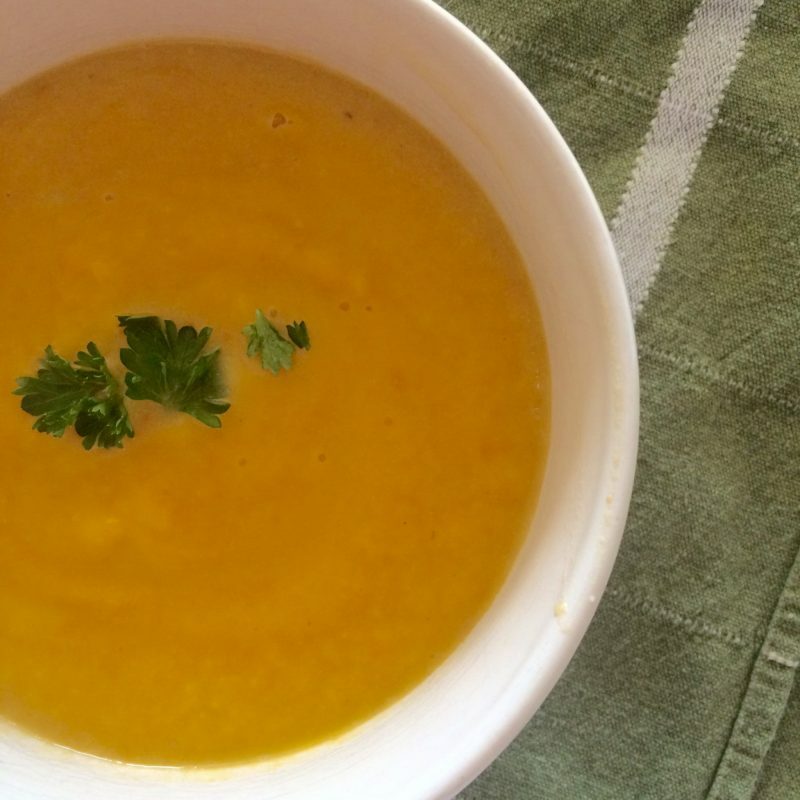 If you’re always struggling to get in those 8-10 servings of vegetables a day, this Creamy Cauliflower Soup is the simplest and tastiest way to solve that problem. Now, let’s face it. Cauliflower isn’t really that exciting. It’s pretty bland, has a funky smell (due to the sulphur content which is actually important for liver detoxification and hormones) and boiling it doesn’t really enhance the flavour by any means. So I suggest, don’t boil it if you really want to enjoy it. Roasting, steaming (then adding lots of grass fed butter), making cauliflower mash or cauliflower rice; these are all more exciting and tastier ways to enjoy it! Then there’s this soup. I’ve loaded it with lots of cauliflower, celery, carrots, onions and garlic and well, that’s pretty much it. (Oh, ok, well, there is bacon which adds the extra deliciousness factor!) Cook it until soft, puree and viola. You’ve got a large pot of delicious and creamy veggie soup that is nourishing, filling, energizing and supports your health in so many different ways. Plus, there isn’t much prep to make this soup. It’s easy peezy, just the way I like it. Cauliflower is amazing for so many reasons! It contains several phytochemicals, such as sulforaphane, carotenoids and indole-3-carbinol – a chemical that helps DNA repair, preventing and slowing the growth of cancerous cells. Plus, these phytochemical support hormonal health and keep your skin youthful and radiant. Now that I’ve convinced you to eat more of it, let’s get to the recipe. Enjoy! Heat a large skillet over medium high heat. Add bacon and cook until brown and crispy, about 6-8 minutes. Transfer to a paper towel-lined plate and set aside. In a large stock pot or dutch oven, melt butter over medium heat. Add garlic, onion, carrots and celery. Cook, stirring occasionally, until slightly soft, about 3-4 minutes. Add in cauliflower and bay leaf. Gently stir to combine all ingredients. Add in broth and milk and gently stir to combine. Cover pot with lid and bring to a boil; reduce heat and simmer until cauliflower is fork tender, about 12-15 minutes. Transfer soup to a blender to puree or use a immersion blend and blend everything together in the pot. *If the soup is too thick, you can always add a little more broth or coconut milk. *There should be enough liquid to just cover all the veggies in the pot. More or less broth may be needed, but 5 cups of liquid was perfect for me. *You could use the the remaining 1/2 head of cauliflower in the soup, but it was just too much to fit in my pot! I made roasted garlic cauliflower mash and enjoyed it for dinner for the next day.